They start out tiny and then grow up so fast. They plow through an assortment of sizes in one year. Their bodies grow and their minds expand. Adults pretty much stay the same size. We have our trusty shoe size that most likely won't change once it is perfected. I rarely even try on shoes anymore. Size 8? Throw them in the cart. Our heads and hands stay the same size too. Sure, our waistlines may fluctuate, and our height might shrink as gravity settles our old bones, but once we are adults, we are adults. And we are adults for most of our lives, if we live a long life. So I am preparing Braeden to be an adult. Ever since we got out of medical emergency mode, and I was able to take a step back and feel more like a "normal" mom, I realized that I had a growing, developing person on my hands. And that growth and development was, well, in my hands. It was my duty to give him the tools to help him become the most amazing person he can be. I know I say that often, but I'm going to put a spin on it for you. I didn't realize, until a few months ago, how my mind motivated me to do this. 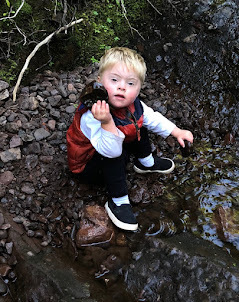 Even though Brady P. has spent most of his developmental life being compared on charts to "normal" kids and other kids with Down syndrome, I choose not to pay attention. It's all irrelevant. Because the goal is not to make him fit in the box of the moment. It's to get him to adulthood -- where, as we have just seen -- is where he will be for most of his life. So Braeden excels in some areas: numbers, letters, shapes, animals, reading, colors, etc. Those academic basics. He is a genius. Does that mean I should slow down teaching him in these areas because he is smarter than some normal kids his age? Hello no. We will keep going because he is hungry to learn. He is behind in some areas: speaking, fine motor, dressing himself, potty training, etc. Does that mean that I am a terrible mother and he will never learn those things? Hell no. I am paying attention to when he expresses interest and skills in these areas, so we can move forward and thrive instead of drowning in frustration and disappointment. He gives me the cues, and I follow. Then I lead with my own ideas. After all, he has years and years before he is an adult. We have time for all those things. Braeden is teaching me how to teach him at the level he is at, which comes in handy when I teach people other things. Wow. I didn't plan to write about this next thing, but I just had an epiphany. So I have started teaching mountain bike fundamentals. Mostly to women, but I've given tips to men as well. Here is what I've noticed when I am progressing a group of bikers: I always, always, ALWAYS take them from where they are at. Sometimes I have a woman who wants to fly over some jumps, and sometimes I have a woman who is afraid to get a tire off the ground -- in the same group. And they all want to learn and get better. Being Braeden's mom has taught me how to watch for cues on when these women (or any person in my life, really) is ready for the next step. Because there are two big things going on here. One is that, in order to keep progressing, we need to keep moving forward and challenging ourselves. The second is that we can't take too big of a leap before we are ready. The nagging fears and lack of skills will end it in disaster -- in the mountain biking case, a broken collar bone or gushing wound (things I have so far not had to encounter). In Brady P's case, extreme frustration and shutting down. We cannot learn if we are shut down. So we take the next step when we are ready. That is how I've been doing it with that little man. So what if he's behind in this and ahead in that? He is himself. And he is awesome. We are moving forward as his interests and skills allow, and we will be perfectly on time for when he is an adult. Because then, he will be in charge of teaching himself. So just for a treat, here is a video taken by the amazing Lindsey Richter at coaches play time in the skills park before last weekend's Womens Weekend. And yes, that was me at the end. Not my best trick, but caught on film! Nice, Amanda! I would love to be able to do those jumps!